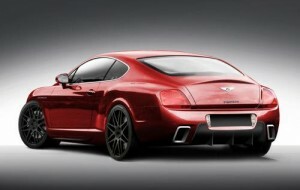 British tuner Imperium has made a one-off version of Bentley Continental GT for a wealthy customer which features unique design inside and out and tweaked performance. What makes this car so special, apart form the coachbuilt-like body, is the fact that it’s been designed to the exact specs of Mr. Customer. The new IMPERIUM Bentley Continental GT conversion features uniquely designed front and rear apron upgrades, aggressive carbon exposed side skirts, subtle boot lip spoiler and rear carbon fibre diffuser. All new bespoke designed bodywork components are manufactured in the UK to the highest possible standards from ultra light prepreg autoclave carbon fibre to create a perfect surface finish and factory fit to the vehicle. The car also gets bespoke one-off designed and manufactured ultra light fully forged alloy wheels. Other changes include optimised braking system, lowered sport suspension and ECU upgrade, plus bespoke interior which gets a new design steering wheel and color combination.